Rugged hand stitched minimalist estate quality pipe & tobacco roll. Can be used for years to come, and be passed down to generations after you. Pack in luggage on your next business trip, throw it in your backpack for your next camp out, hike, or just under your arm as you trek out to the back patio for a smoke. * Pouch on both ends for longer pipes and tobacco. (or 2-3 cigars upto 9" long) * 5 pockets in the center for Zippo, lighters, tampers, pipe cleaners, etc. 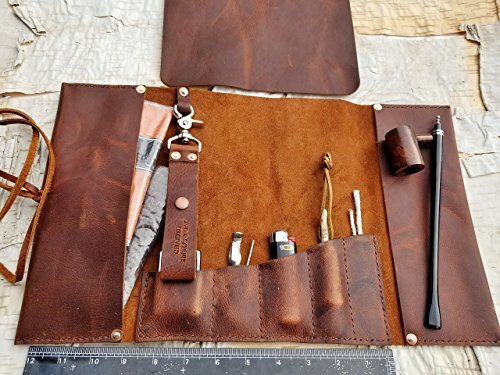 * Ring to attach included pipe lanyard * 8"x9" Packing mat will roll up inside (included) * Pure copper or brass rivets at corners * Hand Stitched with light or dark waxed thread * Each side pocket measures approx. 3" x 10" * Leather strap for quick sturdy closure * 4-5 oz. Kodiak oil tanned leather for decades of durability * Factory tanned edges are used in parts of the design and due to the natural variations in leather, color and texture may vary. * I can personalize this with initials for $5 per Line (1-6 characters/numbers per line), typically just above the makers mark on the inside pocket. I use 3/8" tall all capital lettering, entered desired initials in the notes at checkout when ordering. * No personalization, Dark stitching and copper rivets are our standard and will be used if options are not selected. If you have any questions about this product by Charred Embers & Oak, contact us by completing and submitting the form below. If you are looking for a specif part number, please include it with your message.